From coffee tables to cane swings, Alpha Designer Cane is a furniture studio on Hennur that has grabbed our attention for their modern designs when it comes to both indoor and outdoor furniture. Seeing a cane garden swing through the glass window, we were immediately drawn toward this cane furniture studio at Hennur Cross. When we think of cane furniture, we usually think of old woven chairs and tables at our grandparent’s houses. but as we walked into Alpha Designer Cane we were quite impressed with the modernity in design and how differently they had used cane in their furniture. 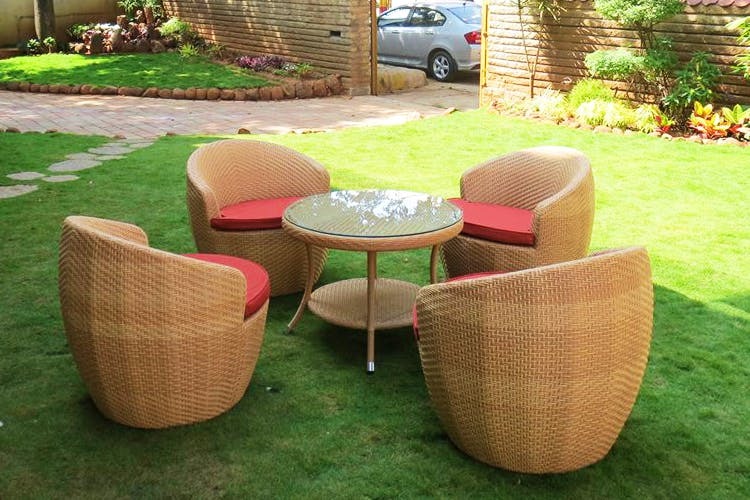 From pool-side sun beds to bar stools, these guys make both indoor and outdoor furniture in rattan cane that they claim can brave any weather. We spotted plush lounge chairs and quaint coffee tables here that would class up any space. Although they have readymade furniture at the store that you can pick up right away, they operate primarily as a made to order furniture outlet. So designs are entirely customisable. If you spotted a cosy bed online and want the same thing in your bed room or have had a design in mind for your indoor bar unit, these guys can recreate it to perfection. Oh! And did we mention these guys also make gazebos. Yep! Have your very own cane gazebo that is sure to bag you the ‘Garden of the Year’ title. Set up in 1999, this store has been in the furniture game for a while now and have developed quite the reputation for its elegant design and superior quality. Run by Mr Vincent, who claims that his furniture is durable and his pieces last years in tip-top shape as all his material is sourced from Germany and the cane he uses is specially imported from Indonesia. Prices are a bit steep here and at INR 8,500 a piece and upwards, we are thinking, this will need some big saving up. These guys are planning to open a bigger unit soon and are going to start selling their stuff online, so keep a lookout for that.